For those who follow me on Twitter, you know I’ve become a huge fan of LG in the last 6 months. So I’m so excited to have an LG V10 in Techcraver headquarters. Since May, when I first laid hands on the LG G4, I’ve become a huge fan of LG and the company’s focus on amazing photography, attention to detail with stunning design and focusing on customer benefits via swappable batteries and MicroSD card expansion. Unlike competitor Samsung, that is focused on form over function with its sealed glass construction, wireless charging and curved screen that can be found on Galaxy S6 Edge+ and the Samsung Note 5. LG has remained in tune with what customers want: an Android phone that delivers practical features, premium design and a focus on the small things that unify into an amazing smartphone experience. So, since the LG G4 is so amazing, what does the LG V10 bring to the table? First of all, this phone brings an all new design made of premium materials. 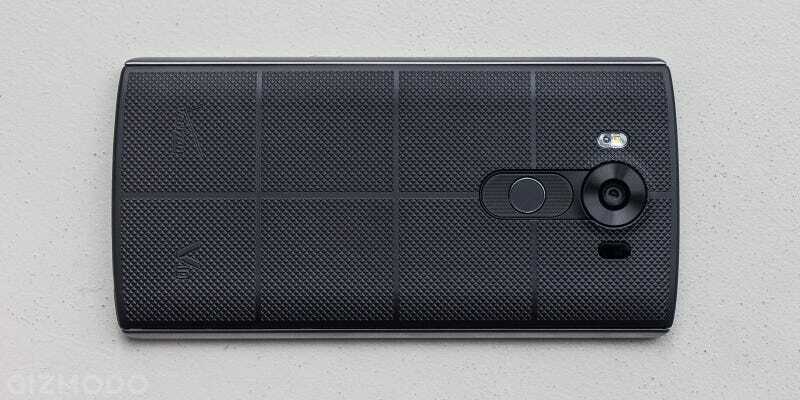 The LG V10 is made up of stainless steel paired with Gorilla Glass 4 and a Dura Skin rugged plastic back. At 5.7″ across, this phone is a large phone that shows no compromise. When you pick up the LG V10, you instantly know this phone means business. Its mass is noticeable but not overwhelming. The smoothness of the steel combined with the fluidity of the glass screams quality design. When you turn the phone on, you activate the beautiful primary screen that displays colors like you’ve never seen and deep, deep blacks. However, with the LG V10, the topic of conversation is the second screen. This little display, above the main and spanning 2.1″, is an always on display. I like that it shows notifications when the phone is off and a clock and date at all times. It’s quite useful. Also, I like how I can have the screen show music controls for streaming. As a T-Mobile customer who’s grown accustomed to alway listening music thanks to Music Freedom, I LOVE always on music controls. The LG V10 offers two selfie cameras, one with a regular angle and one with a wide-angle. I haven’t had a chance to test the selfie cams out just yet, but I look forward to it. Just for kicks, there’s even a mode where you can capture images with all three cameras at the same time. On the back of the LG V10 is a fast and accurate fingerprint reader. I’ve used a Galaxy Samsung S6 Edge+ and I found its reader to be inaccurate and prone to errors often. I’ve also used an iPhone 6s and found its reader to be be fast and very accurate. Now, looking at the LG V10, I love the phones reader to be natural and easy to use. The reader is located on the LG V10’s power button and leads to responsive unlocking. It’s really great. Honestly, the LG V10 has taken a little getting used to. My out of the box impressions told me that the phone was too big and had features that were borderline gimmicky. However, 5 days in, I’ve come to love the high end audio, the extra screen and added durability have spoken volumes to me. Disclosure: The LG V10 was sent to me by T-Mobile so that I can publish my thoughts, feelings and impressions. While I received this phone free of charge, my opinions can never be bought.